Perhaps you have already, consciously or maybe unconsciously, seen it pass by, because it is very striking; Living Coral is the color of the year 2019. It is a coral shade that is lively, yet soft. With a slight golden undertone it also has something like a copper look. With the color Living Coral you can go all the way this year. Both as in your interior, but also in clothing, hair and make-up and home accessories. Do you dare to paint your walls in your bedroom or living room with this color? Or maybe you would rather apply it a bit less daring and let the color rather come back in pillows, plaids or paintings. Not completely convinced yet? The color is cozy, spicy and attractive. It is a very welcoming color and stimulates airiness. The color will increase your optimism! 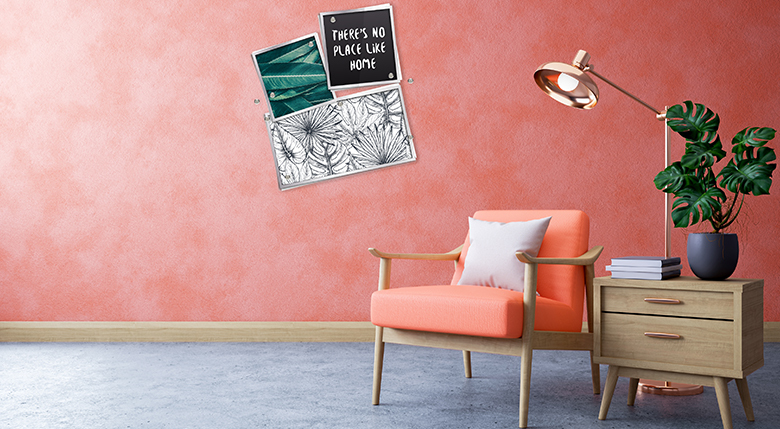 If you are ready for something new in your interior, you can easily repaint your MagnetPaint wall in Living Coral. Scroll trough Pinterest and hang beautiful pictures of nature, for example of an ocean or jungle. You can even do this by using some of MagPaint’s Magnets and you have a completely new look in your interior! To make it a bit easier, I have collected some nice images on Pinterest which will inspire you to use the color Living Coral in combination with MagnetPaint in your own interior. Have fun making your interior spring proof!